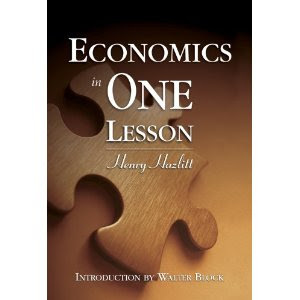 I’ve read a number of books about economics and banking, history and politics, and without a doubt, Economics In One Lesson stands out as the most important book on the subject area. It is setup as a series of 23 different examples describing everyday occurrences to illustrate fundamental economic principles. How a broken window impacts the overall wealth of the community is among the most famous of these examples. Other examples address the value of public works projects, the importance of exports, the impact of taxation on production, the relationship of employment to the minimum wage and the inflationary result of printing money. Take a big gulp and swallow the red pill. Understand there is far more to this world than we'll be shown on the TV news. Get ready to journey to places we're not supposed to find. Read more. 100% goes to promoting this blog and spreading its message. Thank you for your support. © Paul Entin. Simple theme. Theme images by i-bob. Powered by Blogger. Design customization and graphics by Shannon.